The phone rings. It’s not supposed to be ringing. It’s 2 am. The voice on the other line is from an apologetic surgery resident. Resident: There is this patient..
Me: Yes, go ahead. Please. Me: What’s the blood pressure? Me: Audibly groaning. I’ll be in..
Forty five minutes later I’m at the bedside of a decidedly ill appearing man. I want to be triumphant that his heart rate is only 145, and a quick glance at the telemetry monitor above his bed uncovers juicy p waves in a cadence that suggests this is no primary electrical arrhythmia. Something is very wrong somewhere – the heart in this case is an innocent bystander being whipped into a frenzy to compensate for something. At the moment the whip is a norepinephrine infusion being used to keep his blood pressure up. I ask the nurse if the amount of norepinephrine infusing has been stable. She replies that his dose has been slowly escalating. Eureka! I think – the heart rate response in this case is being driven by the norepinephrine – a powerful adrenaline that acts on beta receptors and alpha receptors within the body that increase heart rate and constrict the blood vessels to raise blood pressure. Fix the cause of the low blood pressure, come down on the norepinephrine, and perhaps the heart rate would be better. But it turns out this particular post surgical patient doesn’t have a medical cause of low blood pressure I can find. I cycle through cardiac ultrasounds, blood gases, steroid and volume challenges, and try inching down on the norepinephrine. All of it is to no avail. I’m growing more and more convinced this problem is surgical in nature. Perhaps an infarcted piece of bowel? All I know is that the man acts like he has no peripheral vascular tone. An interesting thing happens shortly after. The norepinephrine drip runs out. As one nurse runs to get another bag from the pharmacy – a quick cascade of events unfolds. The brisk upstroke from the arterial line that marks the pressure wave generated with every beat of the heart starts to dampen. The color seems to visibly drain from the patients face, and he begins to complain that his vision is getting blurry. His systolic blood pressure is 70 – an almost forty point drop within a minute of the norepinephrine running out. I try to keep a level tone. Project control, not panic. “You’re going to be ok, sir. Hang with me.” I squeeze his hand. The code cart – a fully stocked cabinet on wheels with almost everything you need for resuscitation efforts – is wheeled into the room. The epinephrine vial is handed to the nurse, and hurriedly pushed. Within seconds, I can see the blood pressure and heart rate rise. The patient’s grip on my hand relaxes. Or maybe its my grip on his hand. I forget which. His vision returns to normal as his blood pressure ‘normalizes’. Of course nothing has been fixed. Why his blood pressure remains low continues to be a mystery. The bag of norepinephrine soon isn’t enough even at its maximal dose. The same scenario (hypotension -> pallor -> vision loss ) recurs 30 minutes later, and another bolus of epinephrine aborts a rapid spiral towards pulselessness. This case is an anecdote, the weakest possible form of evidence apparently. Yet there are powerful lessons learned that night. Blood flows in pulsatile fashion with a certain pressure head. Below some threshold of pressure, the end organs of the body stop functioning. Agents that are active on peripheral vasoconstrictor receptors (norepinephrine, epinephrine) raise blood pressure. Epinephrine was keeping this patient alive while a team worked to understand why his blood pressure was so low. My suspicion was that he was in something called distributive shock – a catastrophic life threatening syndrome that requires a furious hunt for cause to save the patient. Overwhelming infection and an even more aggressive immune response renders normally relatively impervious vasculature to be a sieve. At the present time the therapy is directed towards replacing the fluid lost in the intravascular space and using medications that act on peripheral vascular receptors that increase peripheral tone. There is, of course, much that isn’t known about this process. Hopefully it will come to pass that we will arrive at a better understanding of what specifically creates this mileu so our therapies may be more directed. But for the time being, our solutions are limited by our current, always imperfect understanding of the world. The culprit in this case was a leak of intestinal contents into the peritoneal space from two pieces of bowel that should have been exactly apposed. The body had attempted to tell us this very thing with that high heart rate post-operatively. It took us, the clinicians, some time to translate. The uninformed prior: Unlearning what has been learned. For many, medicine has for too long been an imperfect science. The history of medicine is replete with physicians acting with certainty in a manner that – in hindsight – was ineffective, or even worse – harmful. Blood letting to allow the release of bad humors is believed to have hastened the demise of the greatest American – George Washington. The disconcerting part of this is that the physician players were not motivated by anything but the best intentions. They relied on their experience, intuition and judgement to deliver exactly the wrong prescription. Intuition fails. No matter how many patients died soon after blood letting, operating biases didn’t let physicians link the two events. After all, the patients may have died even sooner if blood letting hadn’t been done. The idea that medicine had progressed – by the 1980’s – to the point that doctors were not engaged in the equivalent of blood letting came under heavy fire when it was demonstrated a number of standard practices of the time could indeed be ineffective. Extra beats (also known as ectopic heart beats) after heart attacks were noted in cardiac units to portend a higher risk of dying suddenly. The obvious approach to this was to use medications that effectively suppressed ectopic heart beats. Testing this in a double blind randomized control trial did not just demonstrate ineffectiveness, but harm. More people randomized to suppression of ectopic beats actually died. It turns out the anti-arrhythmic drugs being used were actually proarrhythmic as well. The attack on ‘expertise’ that relied on intuition and experience was on, and it was a rout. Glue ear – a condition that developed in the middle ears of little kids after ear infections was treated with insertion of a tube to drain that space. 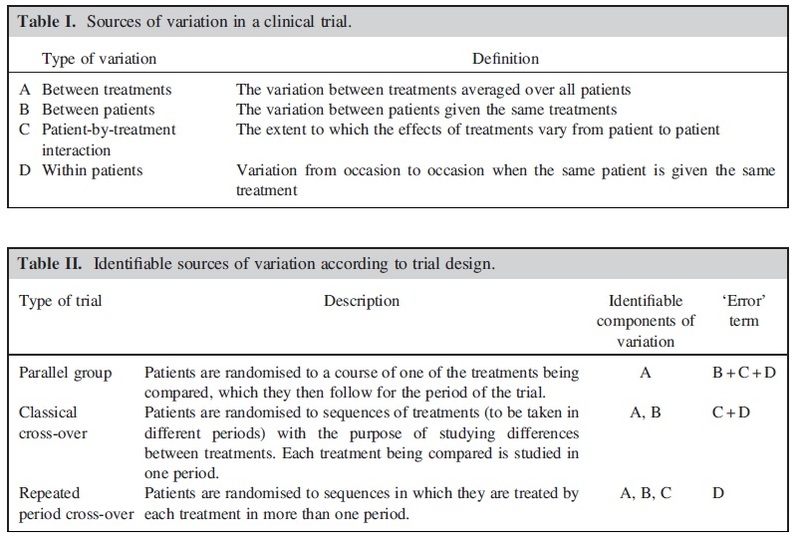 The trial to determine efficacy using a randomized trial to blindly allocate patients to surgery or no treatment? Many of the children turned out to do just fine if you left them alone. Given the fact that all procedures have a certain complication rate, the lack of efficacy here was no small matter. And so it went – the populace had to be on guard not just against the afflictions of disease, but against the intuitions of its doctors. Uncertainty reigned, and in search of certainty, the field fled to the warm embrace of ever greater empiricism. In the early ’80s from the McMaster University in Canada, David Sackett gave voice to a new sheriff – Evidence Based Medicine (EBM). The premise as outlined is simple – don’t believe anything that hasn’t been tested in a randomized control trial. The only real evidence is that found within RCTs or in reviews that amalgamated RCTs. The usual response from EBM experts can be found below in the response to the statement that real evidence may come from outside an RCT. It is quite possible Professor Francis is right on here about the specific subject being discussed, but the point is that there is an established hierarchy of evidence on display. The RCT is king, everything else is no better than the court jester. 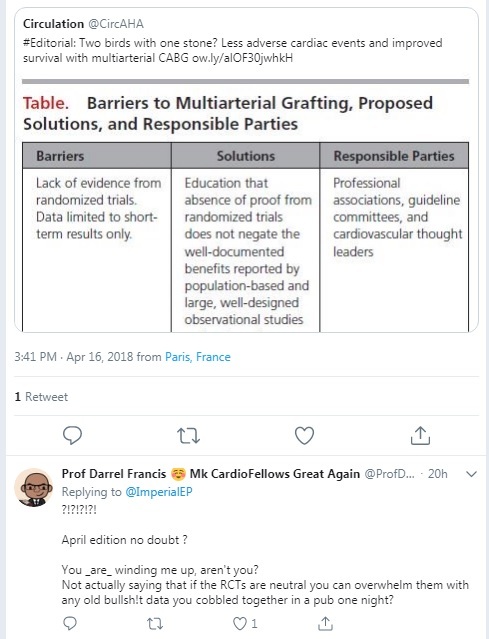 While an RCT may certainly be better than anything cobbled together at a pub, the conventional parallel group RCT certainly isn’t always King of the Hill. As nicely expounded on by the prolific statistician Stephen Senn, there are plenty of potential errors the conventional RCT finds itself humbled by. The clinician may thus feel somewhat mollified about conclusions drawn about the effect of epinephrine in the earlier anecdote. Sackett also noted that there were therapies whose ” ‘face validity’ is so great that randomized trials were unanimously judged by the team to be both unnecessary, and, if a placebo would have been involved, unethical”. In effect, there was always an escape clause to let common sense prevail over EBM. But as frequently happens in movements, the second generation of followers moves in directions unintended by the founders. If the safeguards in place involve only areas where equipoise exists, but equipoise is itself determined by fallible judgement, the range of unacceptable experiments becomes very narrow. This especially applies to new therapies where members of the community not involved in design and development have skeptical prior beliefs. This is, of course, not a bad thing – it is entirely possible that the usually overoptimistic prior of the developers of a new therapy are farther from the truth than the skeptics. But it is a major problem if we ask doctors to discard their prior beliefs that are not based in RCTs. In doing so, we are manufacturing equipoise. This means travel in dangerous ethical waters for physicians and their patients that is at best unwise, and at worst willfully foolish. All methodologies can have problems. You imply that RCTs are inherently inferior to other study methods, or are you rejecting studies in general? We should all just guess? Well, make your case that RCTs are worse than other methods.